1. 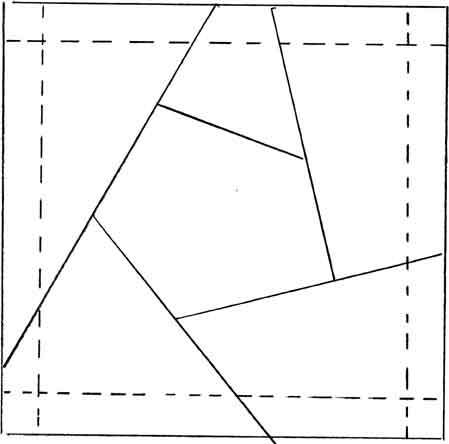 Cut a six-inch piece of muslin to use as a foundation to piece a crazy quilt block using the pattern given (Figure 1). The 6-inch muslin will give you some leeway in squaring up your finished piece just in case your stitching causes the block to be pulled out of shape. 2. Baste around the block on the dotted line. This will be your sewing line. 3. Embellish as desired: be careful not to put your embellishments too close to the stitching line. 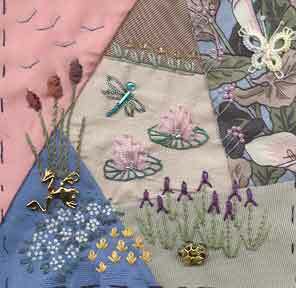 The block pictured uses some of the ideas presented in the Winter 2001 Issue of Quilting Arts. Frog - Beadworks, Boston, MA. To find out how to make your embellished block into a needlecase, see the Winter 2001, Volume one, Number one issue of Quilting Arts. Ena Flynn has been quilting for more than 10 years and became interested in crazy quilting after seeing a silk ribbon demonstration at a local shop 5 years ago. She joined the Evening Star Designs crazy quilt club, but was afraid to cut the fabric! After attending a workshop taught by craxy quilt artist Jan Benander, she acquired the courage she was lacking and has never looked back! Look for more of Ena's designs and projects in upcoming issues of Quilting Arts. COPYRIGHT NOTICE: These instructions and designs are provided for the personal use of our web site visitors. 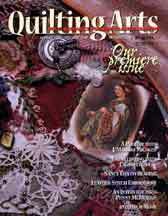 Any other use be it reproduced or distributed in any other form (including electronic) must have the prior written permission of Quilting Arts Magazine LLC.